Southern California Edison says its equipment likely sparked one of two ignition points for the massive wildfire that tore through California's Central Coast last year. Witnesses reported flames near the company's power poles in Ventura County last December, and the utility "believes that its equipment was associated with this ignition," Edison said. Edison hasn't determined if its equipment started the second ignition point nearly 6 miles away. Fire officials declined to comment on Edison's statement because no official cause of the blaze has been determined. A multi-agency investigation is continuing. 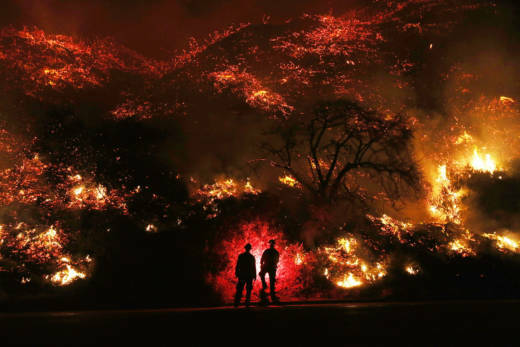 Investigators were looking at "every possibility" ranging from weather to human or even animal factors, and the nearly yearlong probe probably won't be completed for at least another 30 days, Ventura County fire Capt. Stan Ziegler said. The Thomas Fire was the second-largest in California history, scorching 440 square miles and destroying more than 1,000 buildings in Ventura and Santa Barbara counties. Two people died. Edison's disclosure came as an update to investors but was released publicly to keep communities and customers informed, the company said. Robert Curtis, an attorney representing 450 victims of the fire and resulting mudslides, said he believed that Edison made the admission because witnesses already have come forward to say they believe the utility's equipment was involved. "They did it because they're faced with insurmountable evidence that it's their responsibility," he said. Curtis' firm is one of several representing thousands of fire and mudslide victims in a consolidated suit that will be heard in Los Angeles. Follow Christopher Weber at https://twitter.com/WeberCM.